When you are just starting to learn Feng Shui as a beginner you are probably most interested in making your home look beautiful, and perhaps getting some positive energy into your living space. Or perhaps you are following my guide to creating a beautiful meditation space at home so you can relax and unwind any time you like. Either way, Feng Shui can promote positive energy and beauty so you are happy in your own home, office space, or other special place. And you are probably excited to learn the basics of feng shui, such as the Feng Shui Bagua Map—the chart that shows how to map out various elements in accordance with the Feng Shui system. Feng Shui is a Taoist system used to create harmony between the mind and the environment. It is one of the five arts of Chinese metaphysics and today is popular in the West as a means of redesigning homes and living space in order to cultivate positive energy. The basics of Feng Shui are all about getting the right amount of energy flowing through a room. The purpose of doing this is to create harmony between the mind and the environment (which is why Feng Shui is such an excellent accompaniment to meditation techniques). We use Feng Shui to create positive energy and balance in the home, office or other areas. 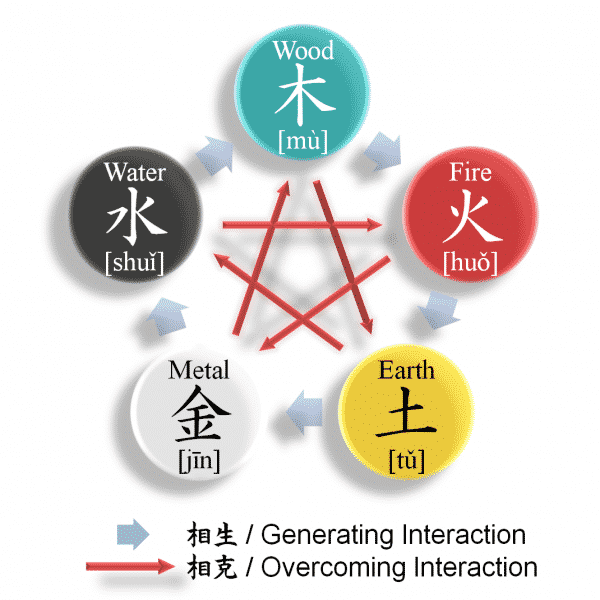 Feng Shui’s central concept is the idea of balancing chi, the world’s universal energy. Feng Shui is about designing our living spaces to maximise the flow of this central, universal energy, which is said to help us relax and to live health, productive lives. Literally translated as “Wind” and “Water”, Feng Shui works on the assumption that, like its two titular elemental forces, all of life is driven by energy that flows and which can be blocked or allowed to flow more freely dependant on the layout and design of objects, buildings and space. In Feng Shui, people are seen as being connected to the spaces they live in, and so by creating peace, flow and harmony in our living space we will achieve those things in ourselves too. Specific feng shui spaces can be created to manifest wealth and abundance. There are several fundamental elements of Feng Shui. Let’s take a look. We’ve already mentioned Chi briefly above, stating that it is the universal energy. The energy of chi is constantly moving and changing life forces around us. Chi enters a room through the door and leaves out through the window and can accumulate in the objects around us. The best way to use chi in feng shui is to decorate a room in such a way that we increase the flow of chi into the room and reduce elements that block chi. There are five basic elements used in Feng Shui, each of which should be used in balance around the home. Wood: Wood represents growth and creativity. To increase wood, incorporate plants, murals, wooden statues, and a Buddha statue. Fire: Fire represents transformation and expansion. To increase the fire element, incorporate clusters of candles and a beautiful fireplace. Earth: The Earth element promotes knowledge, and stability in your life. To increase the earth element use stones and crystals (you an also meditate on crystals). Water: Water promotes wealth and abundance. To increase the water element use bowls of water, water features, and an indoor fountain. Metal: The metal element promotes calm, focus and independence. To increase the metal element use ornate vases, sculptures and wind chimes. Each of these elements is distinguished by a set of attributes, shape and colours, as can be seen in the diagrams below. 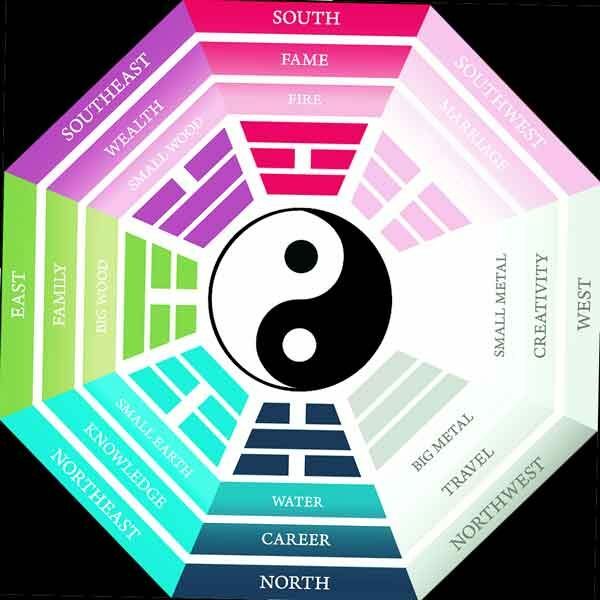 Feng Shui uses a chart called the Feng Shui Bagua map (above) to chart the areas of your home or office and determine where objects and colours representing the five elements above should be placed. The Feng Shui Bagua (map) is a simple tool that helps us to decide how to use the space in the home, office, or elsewhere. The bagua maps the specific spaces to the regions of our personal life. In this way, we can map the parts of our life to specific regions of the home, and increase the energies we need. Hold the bagua so that the Wisdom / Career / Helpful people part is facing you. Decide what part you are standing in. Then use the bagua map to determine where each section of the space is. Introduce elements to the room in accordance with the Feng Shui bagua. This will increase the elements you need in the space where you need them. So, we’ve covered the core basics of Feng Shui. Now, let’s take a look at some of the basic tools and some of the things we can do to begin to increase the flow of Chi in our environments and create a harmony conducive to relaxation, positivity and productivity. Lighting is the easiest way to quickly increase the flow of chi, especially full-spectrum light bulbs that simulate natural light. Fireplaces are also a source of light. Art (painting, sculpture, or textile) can increase Chi. The selection and placement of art depends on the area of the bagua you need to activate. Art should reflect positive images and feelings. Growing Things like flowers connects us to nature and can be chosen with the bagua in mind by selecting shapes and colours from the bagua to activate the areas of the bagua needed. Water Features such as fountains and aquariums stimulate the movement of chi in and around your home or business. Wind Sensitive Objects (wind chimes, mobiles, whirligigs, banners, flags) attract the chi into your environment. Color in Feng Shui is primarily used to represent and balance the Five Elements. Colour adds emotional, physiological, and cultural content to our lives. Sound is used to connect us to others in our environment. Music is a powerful way to uplift the chi in any environment and can help with stressful home or office situations. So, there we have it, a look at the most important Feng Shui basics and an introduction to the Feng Shui Bagua map.